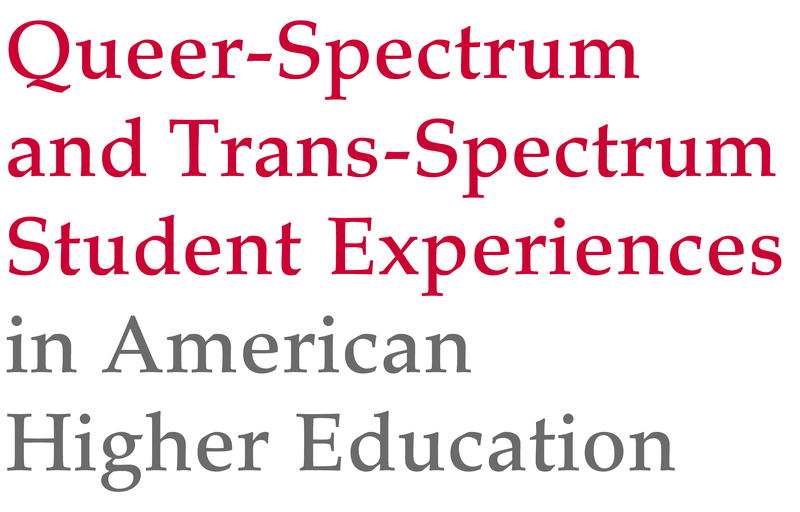 In 2017, the Tyler Clementi Center partnered with the Center for Postsecondary Research at Indiana University, the Higher Education Research Institute at UCLA, the SERU-AAU Consortium led by UC-Berkeley and U-MN, the American College Health Association, and Rankin & Associates on a study of queer-spectrum and trans-spectrum student experiences in higher education. We reviewed the queer-spectrum and trans-spectrum student responses on the National Survey of Student Engagement (2017), the Undergraduate Student Experience at the Research University Survey (2016), the American College Health Association-National College Health Assessment (2016), and the four surveys conducted by the Higher Education Research Institute, including The Freshman Survey (2016), the Your First College Year Survey (2016), the Diverse Learning Environments Survey (2016), and the College Senior Survey (2017). Combined, these analyses included the responses of 66,208 queer-spectrum students and 6,607 trans-spectrum student at 918 unique 4-year institutions across the U.S.— the largest study of this population ever undertaken. Additionally, check out our infographics on campus climate, health outcomes, and academic outcomes for queer-spectrum and trans-spectrum students!